Representatives from ITD’s Division of Aeronautics provided a summary of the state’s air pool costs and revenue from the past three years to members of the Idaho Transportation Board during its monthly business meeting in Boise last week (Feb. 16, 17). The three airplanes ITD operates are primarily for emergency response, but they also are available for state agency transportation as a way of generating revenue to cover their emergency function. Idaho Transportation Board members, without objection, re-elected Gary Blick to serve as vice chairman for the coming year. Blick was first elected vice chairman in February 2010. He has been on the board since 1999, representing District 4. Installation of approximately 700 new Cisco telephones that use VoIP (Voice over Internet Protocol) last weekend went smoothly and was completed slightly faster than expected at Headquarters. Crews began replacing telephones about 5 p.m. Friday (Feb. 18) and finished by Saturday afternoon, reported Bill Finke, who coordinated the technical installation. Goodwill Staffing provided about a dozen temporary workers who were matched with ITD employees and divided into teams of three or four to complete the process. Apparently, it easier with the new Cisco telephone system to inadvertently place an emergency 911 and trigger unintended responses. “Since we have changed over to the new Cisco phone system we are having an abundance of 911 misdials. It is possible to inadvertently dial 911 if you are placing a long distance call,” explained Dianna Magstadt of Human Resource Services. ITD snowplow driver Michael Harvey escaped injury this week when the blade of his truck was hit by a semi-truck. Harvey was clearing snow on a four-lane segment of U.S. 26 near Ririe when a 2003 Peterbilt truck, driven by Craig A. Murdock, attempted to pass and hit the plow blade. The crash sent both vehicles into a field but resulted in no injuries. Recent vandalism at the Mores Creek Bridge project at Lucky Peak Reservoir, east of Boise on Idaho 21, is costly and could compromise public safety. The vandalism not only involved theft, but also tampering with Traffic Control Safety Devices on the project, including the Portable Traffic Signals and the Portable Message Signs. 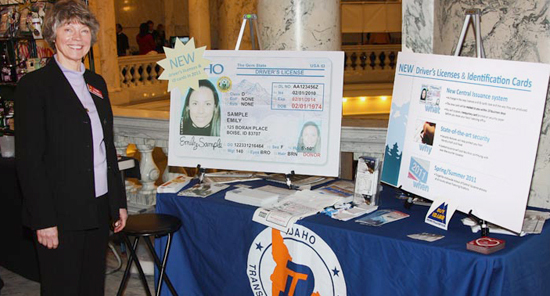 Lynn Rhodes and representatives of ITD's Division of Motor Vehicles took the opportunity at the state capitol Wednesday to explain Idaho's move to central-issue driver's licenses. The presentations were part of "Buy Idaho"
day at the capitol that introduces Idaho products and services to statehouse visitors and legislators. Efforts to improve safety for motorists on Idaho roads could be paying off big with motor vehicle fatalities continuing to decline. Early numbers from ITD show 210 motor vehicle fatalities occurred in Idaho during 2010. This is down from 226 fatalities in 2009 and 232 fatalities in 2008. The lowest number of traffic deaths on record, going back to 1962, was in 1963 when there were 207 fatalities. The state’s population has more than doubled since the 1960s. State budgets are tight, and any cost savings are significant. Partnerships are one way to achieve those savings. That’s why a report of another 6,200 lbs. of trash sitting in the landfill is good news for Treasure Valley residents. Generally, more garbage along the highway – or anywhere else – is never good news. Students from Lake Hazel Middle School had a captive audience this week when they pitched the virtues of a city 150 years into the future. The middle school students presented their award-winning design to board members during the business meeting at ITD Headquarters. Headquarters was her official workstation, but Cheryl Rost’s influence and personal touch extended to all six ITD districts and most of the maintenance facilities. As manager of Employee Safety and Risk Management, Rost was responsible for ensuring that employees operate in the safest environment possible, using the safest equipment available. It wasn’t just her job – it was a professional passion.